Inducted 2007. Class A State Champions. Set State Tournament Record for 2-Day Score. The Raiders were 18-4 during the regular season, but the only tournament title they claimed was at Petersburg Porta. Even after winning the regional championship, QND finished in second place in sectional play at Macomb behind Havana, and only one player (Dan Citro) qualified for the state tournament as an individual. Even after the first day of play at Prairie Vista Golf Course in Bloomington, the Raiders trailed Normal University High by four strokes, despite Citro’s record round of 69 on Friday. However, two dramatic improvements helped the Raiders rally to win the title. Sophomore Kyle Awerkamp, who struggled to an 85 on Friday, rebounded to shoot a 69 on Saturday. Junior Trevor Friye knocked nine shots off his opening-round 85. Senior Charles Scholz turned in consistent scores of 79-77, and Citro’s round of 73 gave him a total score of 142 and individual medalist honors. His score is still the third-best ever posted in the Class A tournament. The Raiders’ two-day total of 604 smashed the 20-year-old record of 612 set by Carmi in the 1977 state tournament. 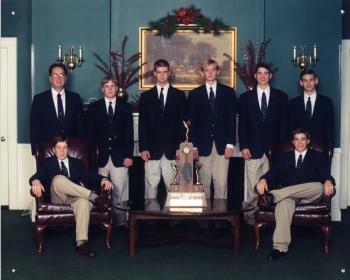 Team members as shown in the photo above are, seated from left, Patrick Gillespie and Adam Peters; standing from left, Coach Mark Longo, Jake Scholz, Charles Scholz, Dan Citro, Kyle Awerkamp and Trevor Friye. Not pictured is assistant coach Chuck Scholz.